You can send out mail directly from Caseload Manager. 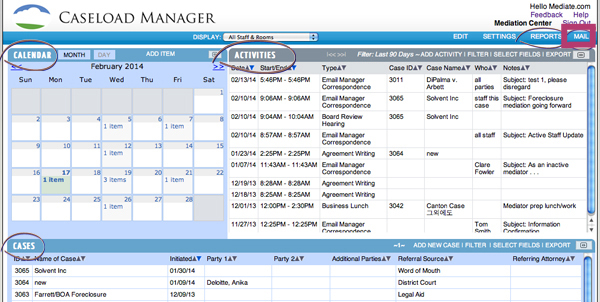 To access your Mail Hub, click on the MAIL button at the top-right of Caseload Manager. IMPORTANT: If you want an email to be associated with a case and filed in that case record, you must click on the case first and then click on the "Email" link within the case record. After you have clicked on the MAIL button, a new window will pop-up. This is your Mail interface. From here you can create your own mail, send one of the predesigned templates, or create your own! You can also add text substitutions to your email which will automatically populate with the desired information. The email will automatically be sent from the person that is logged in the Caseload Manager.